is undergoing a major change. We hope to make it light, informative, helpful and interesting. 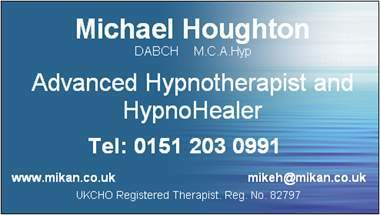 Until then please read the short outline below and if you feel that I can be of help to you please do not hesitate to call if only for a brief chat to discuss your situation. and a UKCHO Registered Therapist (www.ukcho.co.uk), registration number 82797.
plus the more unusual such as improving your golf handicap or other sports performance.